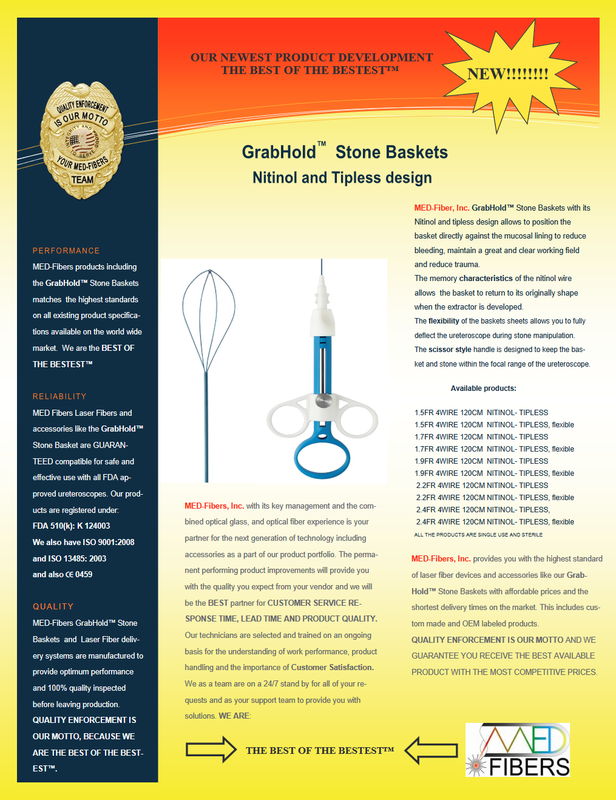 CHANDLER, Ariz., Dec. 4, 2018 /PRNewswire/ -- MED-Fibers, Inc. announces the distribution of MED-Fibers, Inc. GrabHold™ Stone Basket with its Nitinol and tipless design allowing for the positioning of the basket directly against the mucosal lining. This reduces bleeding and maintains a great and clear working field and reduced trauma. The user-friendly scissor-style handle is easy to use and designed to keep the basket and stone within the focal range of the ureteroscope. Handle may be disconnected and reconnected with basket in place. Stone basket with a user-friendly scissor style handle. The memory characteristics of the nitinol wire allow the basket to return to its original shape when the extractor is developed. The flexibility of the baskets sheets allows you to fully deflect the ureteroscope during stone manipulation. Many Different Designs are Offered to Meet Your Stone Manipulation Needs. MED-Fibers, Inc. also manufactures surgical laser fibers; distributing to a global market. They offer surgical laser fibers and accessories with affordable prices and the shortest delivery times on the market, including custom made and OEM labeled products.